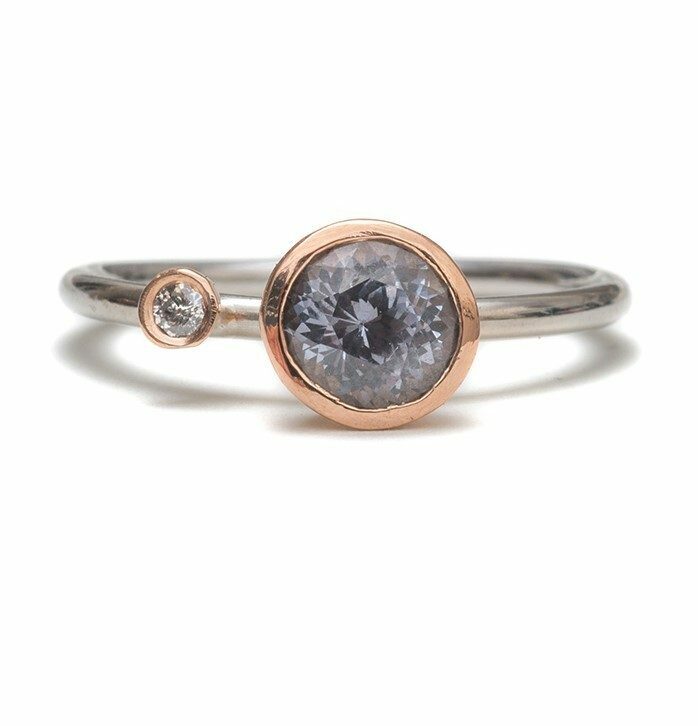 This ring is a variation on my original wrap range, inspired by birds nests and natural structures, these wraps have a light tactile quality . 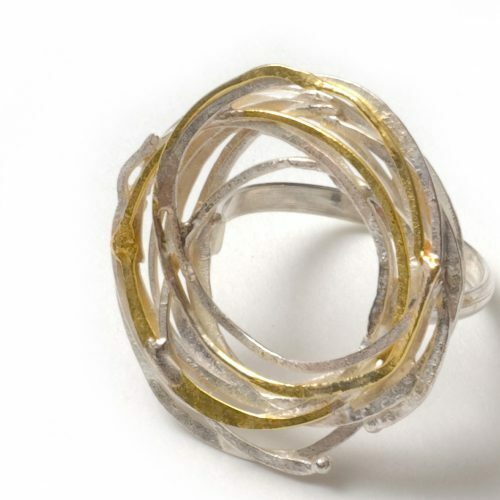 Crafted from hammered and textured silver and 18ct gold wire, interlinked and woven to create a simple and elegant ring. 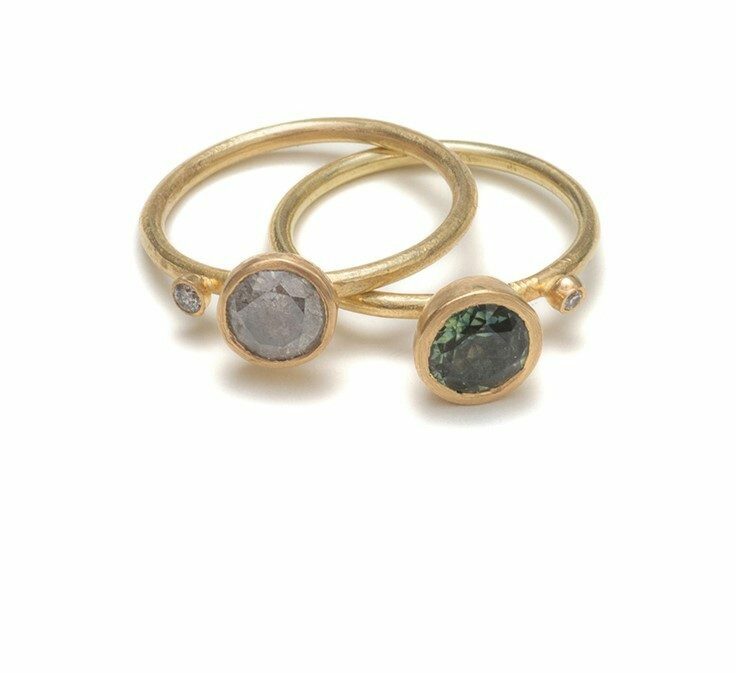 The rings in my precious stacking range are inspired by clusters of pods and flowers, wonderfully versatile rings, they can we worn in a variety of ways. 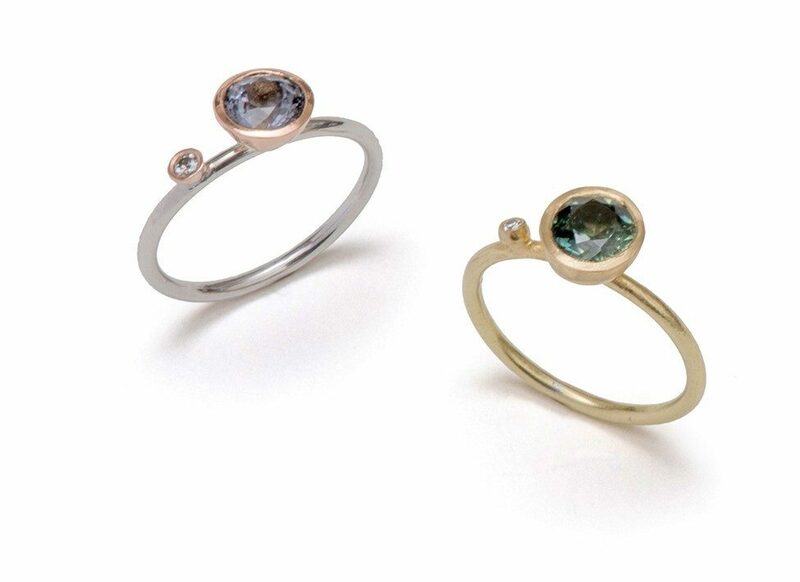 Beautifully vibrant ring stack, hand formed 18ct gold, with green tourmaline set in 18ct gold gum nuts. 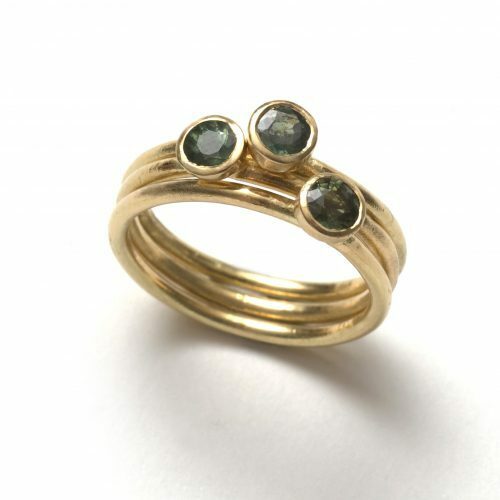 18ct gold and green tourmaline, stones are 3.75mm, 1.5mm shank, 4mm tall setting. 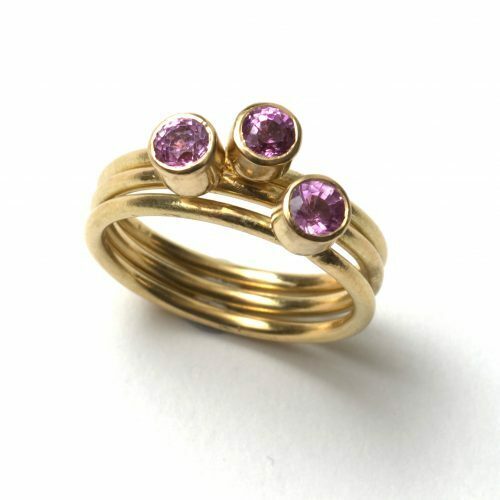 Beautifully vibrant ring stack, hand formed 18ct gold, with pink sapphire set in 18ct gold gum nuts. 18ct gold and pink sapphire, stones are 3.75mm, 1.5mm shank, 4mm tall setting. 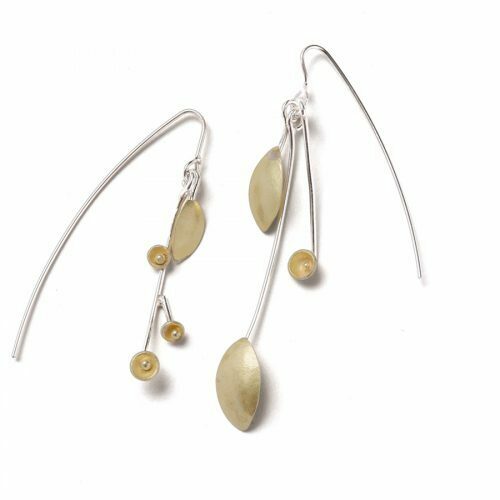 These earrings are from my Spring blossom collection, inspired by my garden, watching the emerging blossom appear in spring, adorning the stark branches. 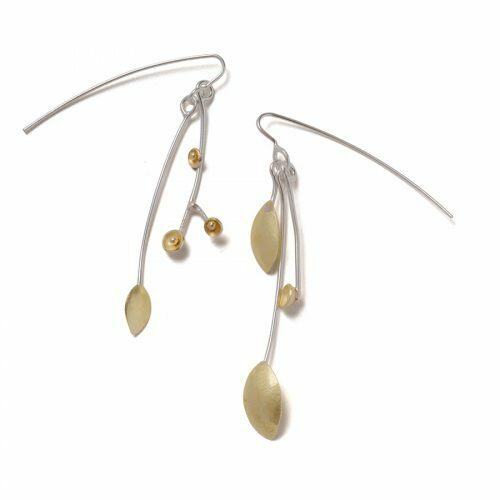 Textured 18ct gold leaves, with small gold bead centred cups, assembled and hung on long slender wires, these earrings are beautifully elegant and simple. 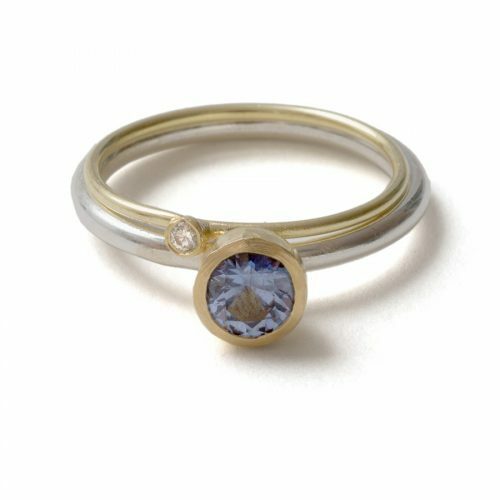 sterling silver and 18ct gold. 65mm long, wires are approx. 60mm long. 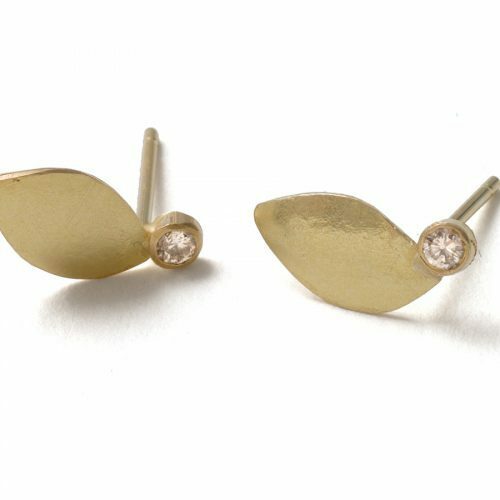 These studs are from my Spring leaf collection, inspired by my garden, watching the emerging leaves appear in spring, adorning the stark branches. 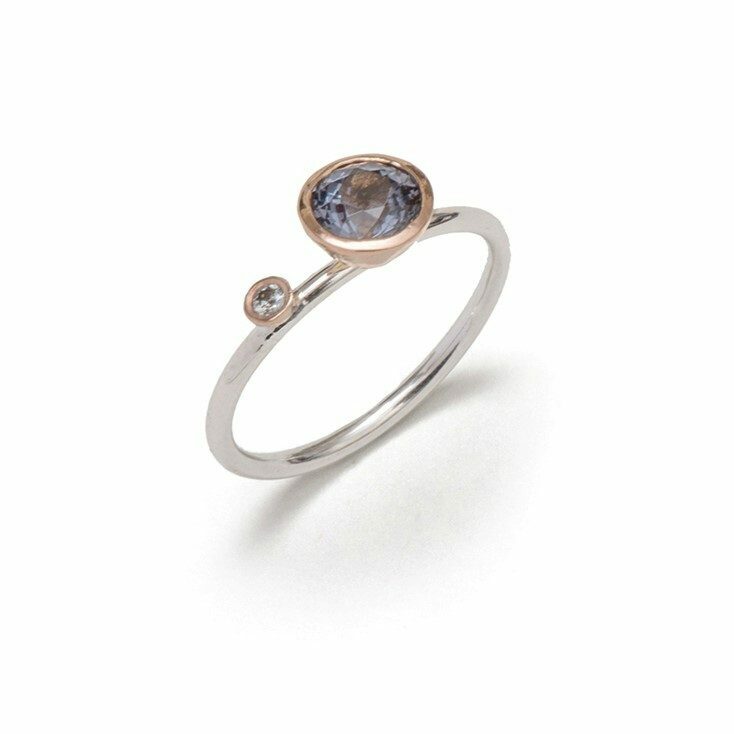 Textured and domed 18ct gold leaves, collet set with beautiful warm round brilliant cut champagne diamonds. 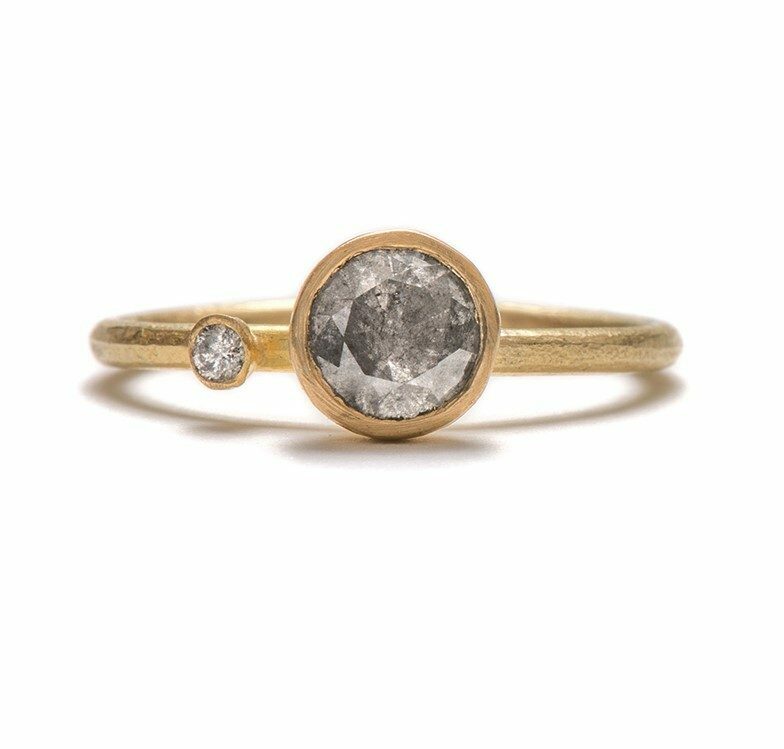 18ct gold, .09ct champagne diamonds. 12mm x 7mm 2.6mm setting. 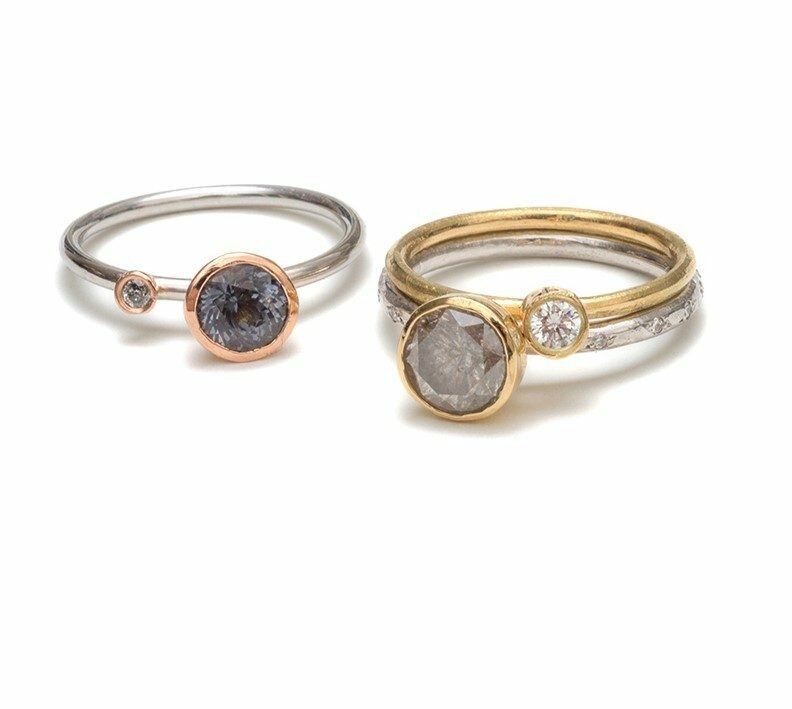 This beautiful set, created from textured and hand formed 18ct gold, has a lovely grey spinel and round brilliant cut diamond, both in collet settings. 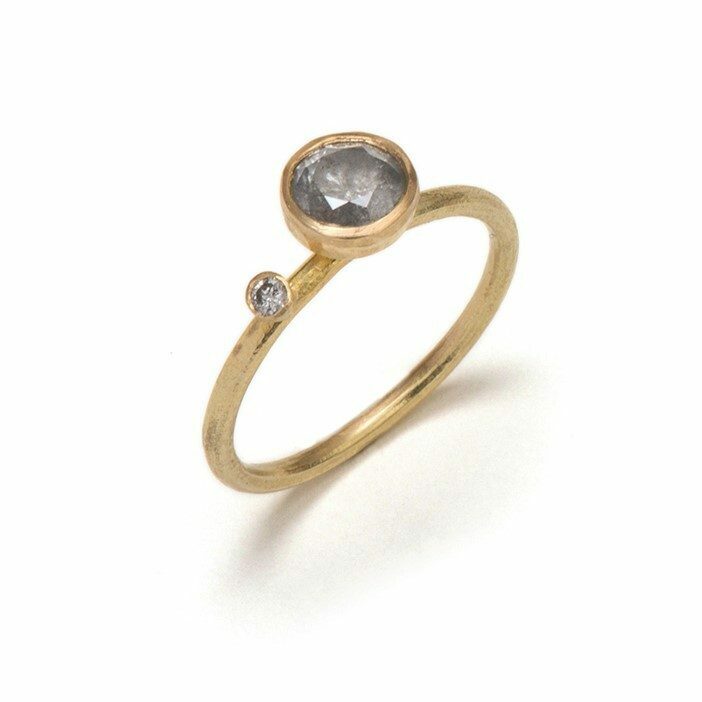 18ct gold, 5.5mm grey spinel and 0.025ct diamond. 2mm and 1mm 18ct gold bands, 6.5mm and 2.6mm settings. 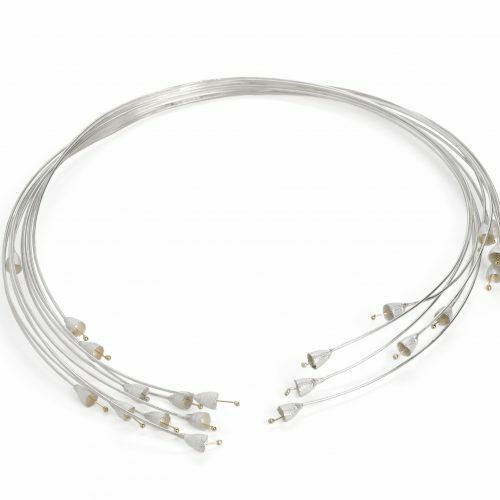 1.5mm 18ct white gold band and 1mm 18ct yellow gold band, 5.5mm and 2.6mm settings. 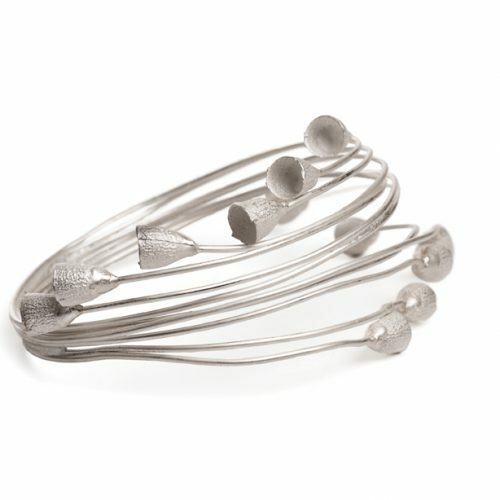 This bracelet is from my gum nut range, inspired by my first visit to Australia, where I collected and sketched gum nuts in Adelaide, at the arboretum. 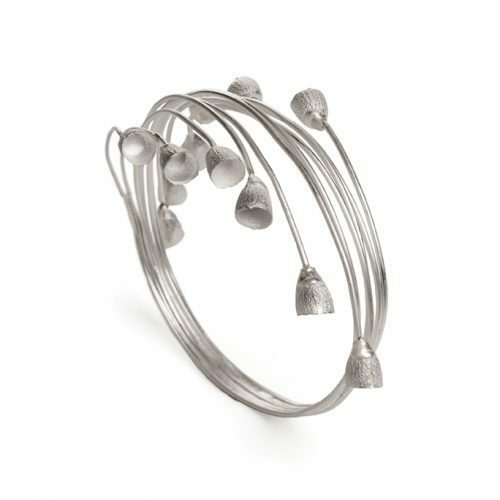 silver cast gum nuts are assembled into a multi wired bracelet, which flows around the wrist, with gum nuts hovering over the arm. sterling silver and 18ct gold, approx. 65mm diameter and 20mm wide. 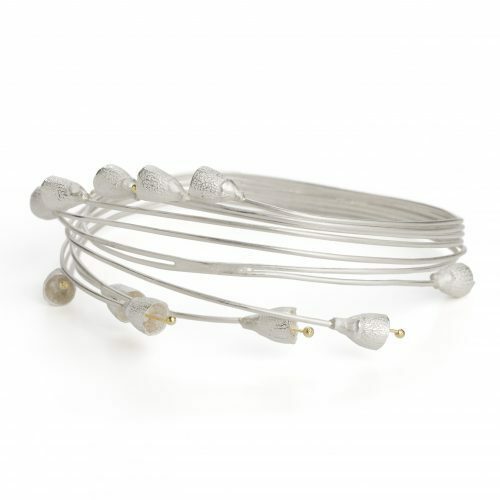 silver cast gum nuts are assembled with 18ct gold detail into a multi wired bracelet, which flows around the wrist, with gum nuts hovering over the arm. From my gum nut range, inspired by my first visit to Australia, where I collected and sketched gum nuts in Adelaide, at the arboretum. 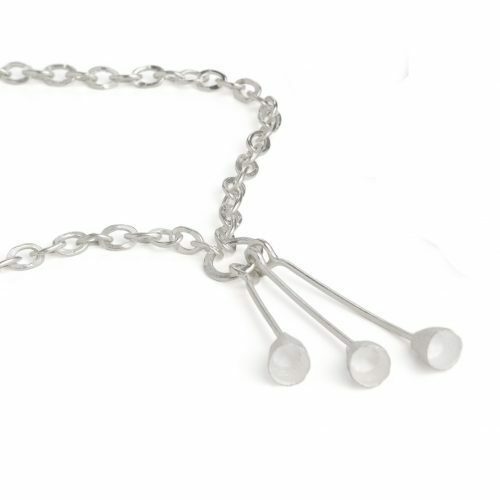 Silver cast gum nuts hanging from a hand formed textured wire bracelet, this bracelet is beautifully elegant and simple. 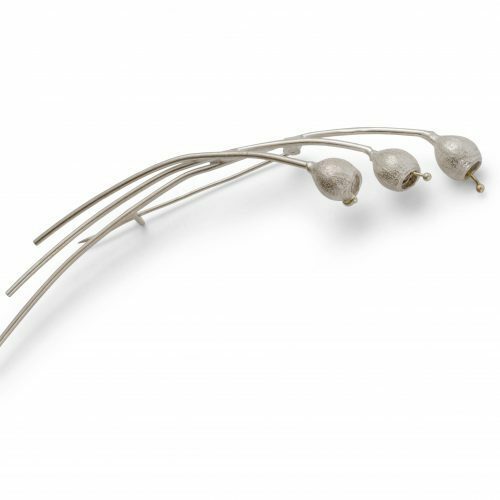 Silver cast gum nuts assembled with 18ct gold detail and assembled on long elegant wires, this brooch is beautifully elegant and simple. sterling silver and 18ct gold, 120mm total length. 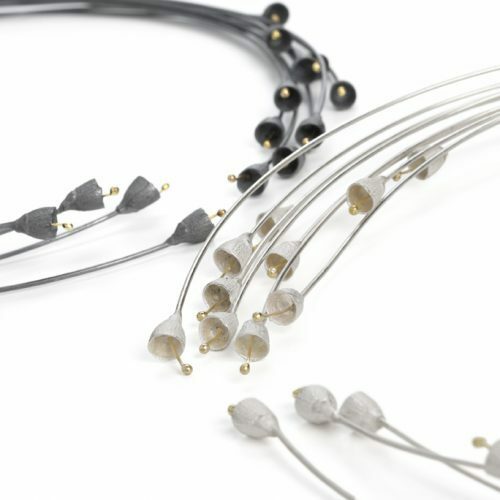 Silver cast gum nuts are assembled with 18ct gold detail into a multi wired choker, which flows around the neck, cascading slightly towards the front, a beautiful piece. sterling silver and 18ct gold, 20cm in diameter. 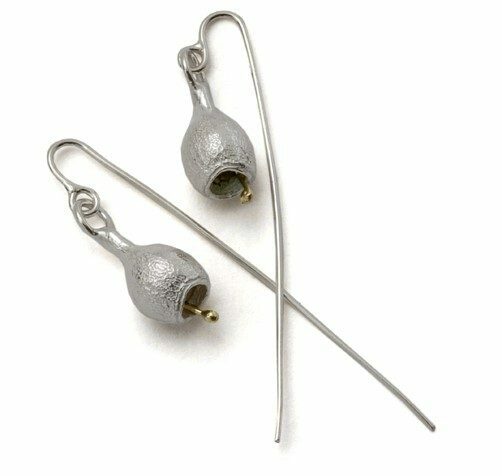 These earrings are from my gum nut range, inspired by my first visit to Australia, where I collected and sketched gum nuts in Adelaide, at the arboretum. 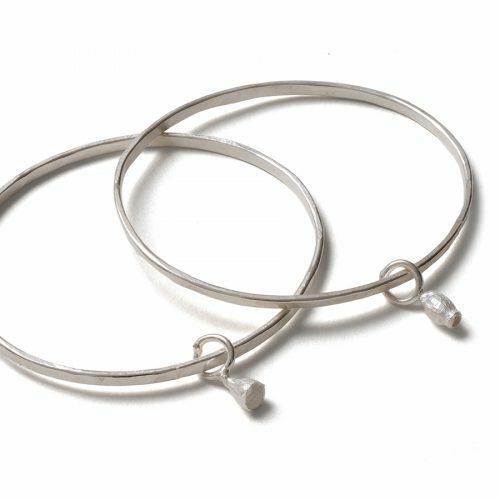 Silver cast gum nuts assembled with 18ct gold detail and hung on long slender wires, these earrings are beautifully elegant and simple. 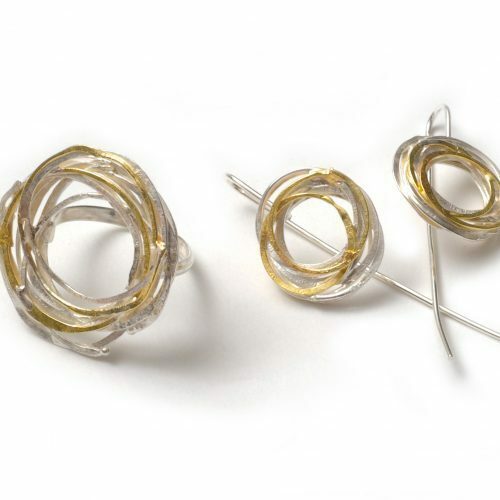 sterling silver and 18ct gold, 15mm long, wires are approx. 60mm long. 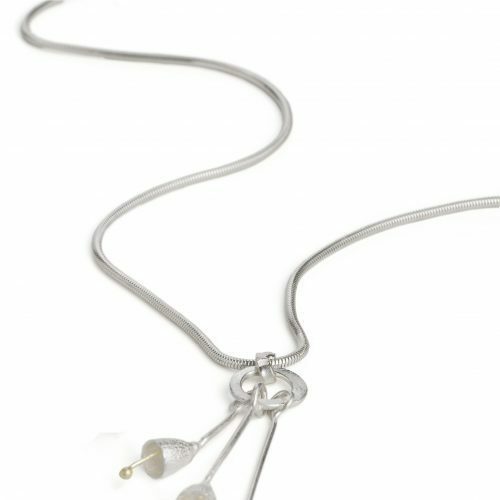 Sliver cast gum nuts are assembled into a multi layered pendant, hanging from a hand hammered chain. sterling silver and 18ct gold, 45cm long chain, 50 mm drop. 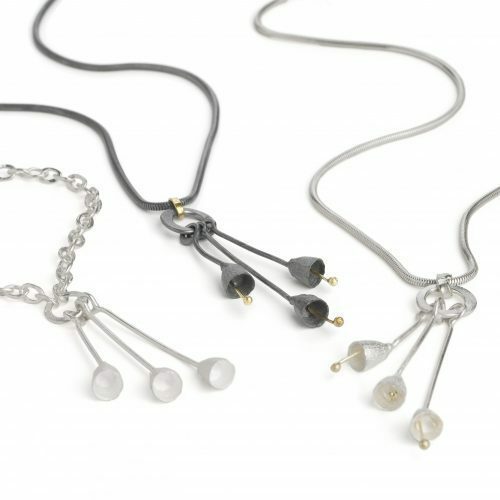 Silver cast gum nuts are assembled with 18ct gold detail into a multi layered pendant, hanging from a simple snake chain.